"One must teach in two languages, affirm the cultural values of both home and school, teach standardized forms of the two languages but respect and affirm the multiple varieties and dialects represented among students in class, be a creative and flexible teacher, serve as a catalyst for discovery as students learn to operate effectively in their multiple worlds, be able to mediate and resolve intercultural conflicts, keep students on task and on and on." This simply means that teachers have to teach the rules and codes of power (Delpit) while respecting the students' first language and culture! "Be Aware that children use first language acquisition strategies for learning or acquiring a second language." "Do not think of yourself as a remedial teacher expected to correct so-called "deficiencies" of your students.
" Don't teach a second language in any way that challenges or seeks to eliminate the first language. "Teach the standard form of English and students' home language together with a appreciation of dialect differences to create an environment of language recognition in the classroom." "Do not forbid young students from code-switching in the classroom. Understand the functions that code-switching serves." "Provide a literacy development curriculum that is specifically designed for English-language learners. "Provide a balanced and integrated approach to the approach to the four language skills: listening, speaking, reading and writing." What Virginia Collier is describing is a new form of teaching; different from what is in place now, that allows the student to learn their second language, while preserving their first language. This is done by allowing the child's first language to be used in order to understand their second language. While helping a English Language Learner, as a student teacher, I was able to mirror this model simply by using Spanish words to help the child better grasp his English alphabet. One simple inclusion made an impact on this child's learning for the better, and that all that a teacher wants, right? space and nature and the way things work. They played with language. They both grew in wisdom and they learned how infinite and mysterious knowledge is... "
to successfully grow in their education. "The natural phenomenon of code-switching should not be forbidden." How wrong you are Regina...How wrong you are! 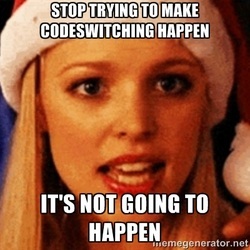 We code-switch every Wednesday, looks like you can't sit with us! "Bilingual speakers are aware that each of their languages has certain strengths and that two languages can be used simultaneously to convey the most precise meaning." - According to Collier, code-switching is important because it helps them figure things out. When a student goes in and out of their dominant first language and English they may be trying to work out the problem. CODE-SWITCHING SHOULD ALWAYS BE ENCOURAGED! I'll never forget the moment this situation happened. I was absolutely taken aback by the young girl's comment that "boys should only speak spanish when talking to girls." Now I don't know where she got that idea maybe a secret education from television or maybe that's what she hears at home. But the major issue with that statement is that she was trying to prohibit the young boy from code switching. It was obvious that he had switched from English to Spanish because he was trying to work through the problem. At this moment I had a choice. I had a choice whether to sit there and let the comment slide or say something. I decided to say something to reassure the young boy that it was alright to speak spanish and whenever he found it necessary to do so, he was allowed to do so. I'm glad I did say something to him because he could've never wanted to volunteer sort of what we read about in the article Aria where the author Richard Rodriguez talked about learning English and how he stayed silent because he didn't feel as if he knew what he was talking about. This is exactly why Collier says it's important to allow code-switching. Collier also states that when they code switch, it's not indicative of them not knowing how to solve problem. It could potentially be them trying to solve a problem. Teachers need to embrace a student’s language even when it isn’t English. In my service learning I noticed that the teacher was regularly correcting the bilingual student’s pronunciation of words and letters. Collier believes that bilingual student’s first language will impact an individual’s pronunciation of second language letters, sounds, and words. As seen in the classroom I worked in the bilingual student began to retract from answering questions as often. Collier believes that this is because the student feels as if his language isn’t respected and he will be wrong because he is constantly corrected.